The Owen Franks neck roll on David Pocock at Eden Park. AUSTRALIAN rugby great David Campese is furious at World Rugby's failure to protect David Pocock from a serious neck injury. And Wallabies captain Michael Hooper has also weighed in as fears grow for his star teammate's playing future. Campese, Australia's all-time leading try0scorer, took to Instagram to vent his frustrations on Thursday - before Pocock was ruled out of Saturday's crucial Rugby Championship Test against the Springboks in Brisbane. Pocock, the world's premier breakdown exponent, has been battling neck pain and stiffness since the second Bledisloe Cup loss to the All Blacks last month. He was named in the Wallabies' initial team on Thursday but withdrew on Thursday and was replaced at No.8 by Pete Samu, who will make his first Test start. "Why do we have laws in rugby that are not enforced? The neck roll is illegal and very dangerous," Campese wrote. "As a parent with kids that play the game and a coach of grassroots rugby, I am appalled at an oversight of this nature. "Where is the accountability from the referee or the IRB?" Campese also shared a video of All Blacks prop Owen Franks' "neck roll" on Pocock from the Test at Eden Park. Franks was penalised by highly rated referee Wayne Barnes but the matter went no further. Pocock was in pain throughout the match but played on and didn't complain about the issue in post-match interviews. He has not revealed the exact nature of the injury and it is unclear whether he will be fit to return in the following Test against Argentina on September 15. Hooper - a fellow backrow warrior - spoke to media on Friday to underline the seriousness of the problem. The Wallabies were upset with Ireland's treatment of Pocock in the June series and have sent video to World Rugby to highlight their concerns. "It's a significant injury and a significant issue," Hooper said. "The coaching group sent in clips to World Rugby and as far as we know, the coaches have told me, they said it doesn't meet the red card threshold. "Now, neck injuries are a pretty big part of the game and I know, being in a similar position to David, you want to be protected and it's about player safety. "It's now cost us David, having to sit out, and being concerned about a pretty vital part of your body. "As a fellow player you've got to sympathise with that." Speaking after the All Blacks Test, coach Steve Hansen said injury was part of Pocock's profession. He said his players did not deliberately inflict neck rolls but they were sometimes an unfortunate part of the breakdown battleground. Hooper agreed - to a point - and called for player input in solving the divisive and dangerous issue. "It happens very quickly, in the moment, and as a player on the other side, you're not looking to intentionally inflict pain on someone or inflict a serious injury," Hooper said. Jack Maddocks comforts an anguished David Pocock at Eden Park as the star Wallaby feels the effects of having his neck twisted. "Sometimes these things do happen but how we avoid that is the conversation that we need to have. "It's very hard on the field, I understand, these things happen very quickly and slow mo's paint a different picture. "When you look up at the big screen and there's a crowd involvement and things like that - how we get the right outcome for all this stuff is what we need to look at. "And I think players need to be involved with that." While Pocock's unique qualities were irreplaceable, Hooper voiced confidence in replacement Samu, a two-time Super Rugby champion with the Crusaders. "I've been very impressed with Pete and his performances throughout the year," he said. "I love playing with Pete." 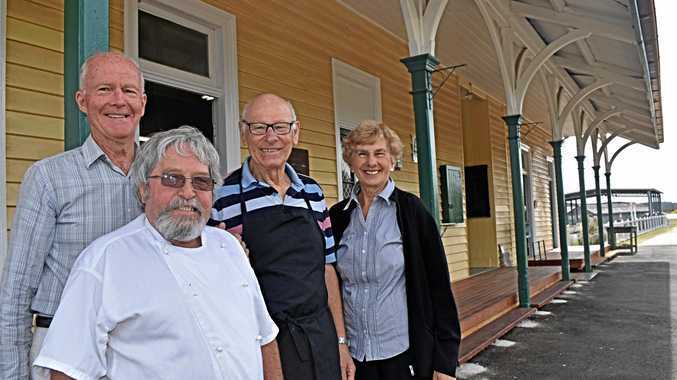 News Stanthorpe's newest cafe has opened its doors and is calling for volunteers to help make its unique vision a reality.